The South Point Lookout Trail #123 is well worth the uphill trek. 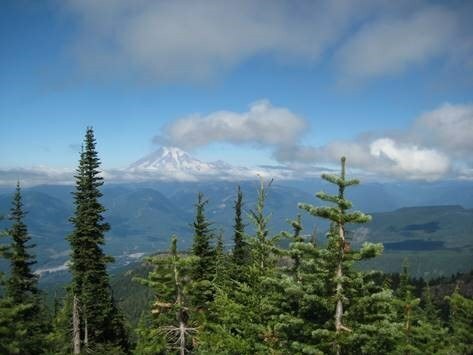 At the top, hikers are greeted with views of Mount Hood, Mount Rainier, and Mount Adams. Learn more about this area and how to plan your visit. South Point Lookout Trail #123 is located in Gifford Pinchot National Forest. The path used to lead to a fire lookout, which was established in the 1920s and dismantled in 1972. Gifford Pinchot National Forest is one of the oldest National Forests in the United States and is situated in the south central portion of Washington State. It was originally established in 1893 as the Pacific Forest Reserve. In 1949, following a series of reorganizations, President Truman named the area the Gifford Pinchot National Forest to honor the founder and chief of the Forest Service. When I first heard about the South Point Lookout Trail, my friend described the “excellent views" which were "worthy of the sweat to get to the top.” I was a little worried as he played it up as being “super steep,” with just over 3,000 feet of elevation gain and seven miles roundtrip. Once we got on the trail, I realized that it was steep, but manageable. In fact, it’s a must-do trail! The forest appears to be recovering. The understory (vegetation between the forest canopy and the ground) was filled with ferns and shrubs. The canopy provided much needed shade and a cool reprieve from the sun on our ascent. 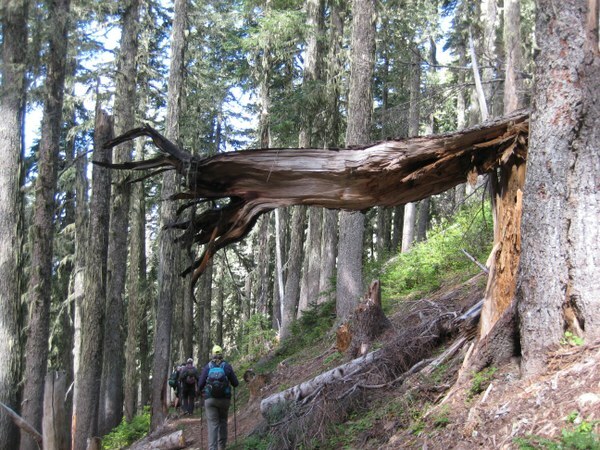 The trail made me think of the Tubal Cain Trail with its many downed trees. At roughly 4600 feet, we crossed over what appeared to be a dry creek bed. Here, we stopped to see if we could find a certain old growth Douglas-fir, a survivor of the 1902 and 1918 fires. After a couple of miles the jeep trail ends, and the path narrows and becomes rockier. It steadily gains in elevation, switch-backing to the top of the ridge and the remnants of the old, dismantled lookout. Along the way, we saw plenty of mushrooms, wildflowers, and birds. Every once and a while, through the forest, we could catch glimpses of ridges and mini-peaks located across from us as we ascended. At roughly 5600 feet we made it to the saddle, with our first real views of Mount Rainier to the north and Goat Rocks to the southeast. Continuing along the saddle for 300+ feet, we emerged to find stunning views of Mount Rainier, the Tatoosh, Cowlitz River Valley, Goat Rocks, Mount Adams, and Mount Hood. Sadly, Mount St. Helens played peek-a-boo among the wispy clouds, never really showing us her true magnificence. We spent just under three hours at the top picnicking, relishing the views, soaking up the sunshine, and relaxing under the deep blue sky – a perfect day to be on the trails. For best views and sunshine lounging, I recommend hiking this trail on a clear, sunny day. Please keep in mind that we didn’t observe any water source on our trip. Make sure to come prepared. Also make sure to carry the 10 Essentials and practice Leave No Trace. Drive south on I5 for approximately 20 minutes, until you hit HWY 12. Take HWY 12 east for about 1 hr 40 min, roughly 84 miles (3 - 4 miles outside Packwood). Turn right onto Forest Service Road 20, driving up the road for about 5 miles, crossing over a one-lane bridge. Just beyond the bridge is the unmarked trailhead on the left side of the road. Park on right side of road with room for approximately 3 vehicles. Author Regina Robinson explores a new topic each month in her "Did You Know?" series, which comes out in the Olympia Branch Newsletter.